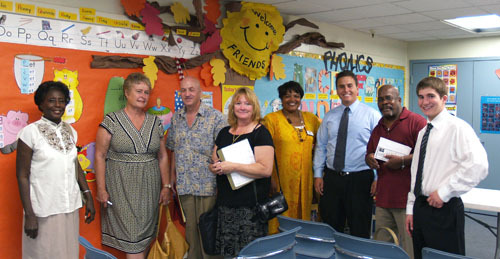 October 22, 2008, Bob (my husband) and I traveled to High Desert Democratic Club and I spoke and answered questions about issues concerning our district. From the Antelope Valley Festival to Rialto! Well it’s been an exciting couple of weeks, on October 11th, 2008, Bob and I traveled to the Antelope Valley Festival where I met and spoke to many great people then we drove all the way to Rialto to celebrate San Berardino County turning blue where I got to see Ed Ansner and Lieutenant Governor John Garamendi (who has announced he’s running for governor of California) who joined the blue county celebration where democrats had out registered republicans and turned the total county registration blue. AARP Video on me? Fill in my name to see for yourself!!! If the above doesn’t work, click this link to open it in a new page and watch the video! 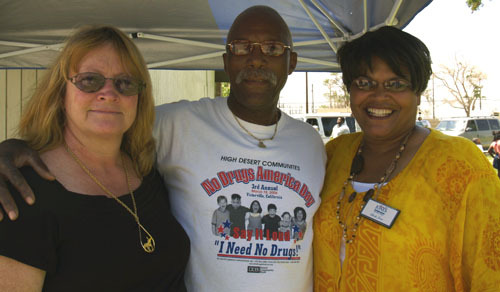 The Obama Campaign in Victorville and Barstow!! I am looking forward to many really good CHANGES in our government and I am happy to be working with our wonderful volunteers and staff of the Obama Campaign. There is alot to do to get out the voices and votes of the people in our communities! You can go to the Obama Campaign website and sign up to help make these things happen!! Our Democratic candidates, Senator Obama and Senator Biden, will make a great team! They will be our next President and Vice President of our great country!! As your Congresswoman, I will be working with our new President and will be looking out for your 25th Congressinal Districts needs! Your 25th Congressional District is very important as it is where you might just live, where your children or yourself atttend school or college and you work! We have high unemplyment, high gas prices, high grocery bills, high costs of a College education and many other problems…. !..so do you have an opinion? Do you have thoughts about Our 25th Congressional District and what are some of your solutions today?? Write me a note! I am looking forward to serving you! Go Visit a local Fair! 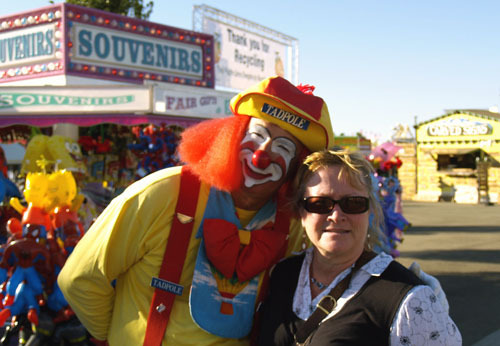 Hello-I am having a great time visiting with people at the Antelope Valley Fair! There are some great shows and Exhibits this year! As usual there is great food and conversations! I like their new facility and it’s well organized! Coming in September is the Los Angeles County Fair! I enjoy that Fair, too. Our family goes to thet Fair every year as we enjoy the beautiful gardens, the great music and shows, Exhibit Halls,and the food! It’s worthwhile going to! I am a past board member of the 28th Agricultural District. The Fair it’s self is located in Victoville. Before I was a Board member, my husband and I used to take our children there when they participated in the 4-H program! I love seeing the new young faces involved in 4-H and the FFA programs. There is also Grange members and Independents! Our family continues to go every year! All our Fairs have rich educational values, they teach great work ethics and team work! I just want to encourage everyone to take the opportunity and go to the Fairs! I know there are alot of good movies, but Fairs are something all family members and friends can enjoy together and build new memories! Whether a Fair is local or a little further away, Fairs are part of the backbone of our America and a part of our great heritage! (15) consolidating government agencies that perform substantially the same services. I was campaigning from Barstow to Santa Clarita! We had many people from the 25th CD and even people from other areas calling to get out the vote! It was a tight election, very close for Mckeon! I think that is great!! One good thing that has happened in this election, (l no matter what some of the people say), we can say “President Obama! !” Yeah! I would like you to know how much I appreciate all your votes and all you have done to get me to election day with the highest vote count ever in the 25th Congressional District! I could never have got this far without all of you! I have met alot of great Californians during my campaign and still have contact with many! People have asked me if I will run for the 2010 election–I have not decided. You know campaigns cost money and time or visa versa….so I would like to let you know what kind of dollars were spent for this race for the 25th CD! Well, Buck McKeon(Republican), spent over$ 800,000.000. I spent about $10,000.00 due to the incredible grass roots volunteer effort! While that got us far, I will need more paid advertising (radio and TV) to inform people about the many issues Buck falls short on is needed, not just after a primary, but in the year leading up to the general election! If I run for office again, I need to reach the people who did not vote for me and the ones who might not come out to vote in a non-presidential cycle election. It is costly to run and Buck Mckeon has already began collecting his $$money for his new Campaign to run for Re-election!! I know that I will need $100,000.00 at least! I need more money and more volunteers, to make that happen! and….that’s so much money in this awful economy….Let’s discuss this and don’t be shy! Get involved and help people, by getting your vote in the mail or going on November 4th. 2008 to your polling place and vote! Today there are alot of people who are registered to vote! Some have never voted before and this November 4th, 2008 will be their first time!! There are people who have moved and did not re-register at their new address. There are people who have changed their party and not re-registered. There are people who never find out where their voting location is! Do you need to re- register? Maybe you are in one of the categories I just mentioned. If you are, then follow through and register today! Just to make it easier on yourself, check the vote absentee box! What is absentee? Absentee is not having to go to your local voter precinct and vote there on election day. Absentee voting means that you will get a book and ballot in the mail, with a return by mail envelope addressed to the county registrar of voters. You complete the ballot , take off your receipt (the small one that has the number of the ballot on it-that is yours) and then put the large ballot folded) in the return by mail envelope, seal it and put enough postage on it. There is on the back of the envelope a place where you will have to sign your name. Put a stamp on the envelope and put it in the mail! If you forget to mail it, you can drop the ballot at your polling station. Call your county registrar to see if they allow dropping it off at other polling stations. Well on election day, your ballot will be counted with everyone else’s ballots! Let’s change America. Dental Care Goes Beyond Toothpaste! ust the other day when I was speaking to some local seniors , one of them spoke up about the lack of coverage under MediCare and private insurance for FALSE TEETH! How can we allow that! The government pays for prosthetic limbs but not teeth. Can you believe that? How can a person take care of themselves if they can’t chew the food and break it down and how can seniors avail themselves of nutrition programs at senior centers without teeth? How strange it is to think such a thing is not taken care of? Also I can’t believe the republicans put through the prescription coverage plan without giving the government the power to negotiate the cost of drugs downward! Without the prices negotiates to at least cash prices that uninsured people can sometimes get from pharmacies, the MediCare drug benefit gets wiped out long before the end of the year. So much for the republican rhetoric about the “free market”–I guess the free market doesn’t apply to the drug companies when they want to gouge us! Well one of the problems we face in this country is the lack of health care -for millions of Americans. For some, the care is denied by use of pre-existing condition exclusions, the care requested is experimental or not in the standard of care options their non-doctors will accept (so the requested care is unreasonable and unnecessary), the charges are excessive if they somehow authorize the care–to name a few. Today I saw the Prime Minister of England talk with Bush in the Rose Garden. While Bush was admitting our economy was having some trouble, the British Prime Minister was talking about a tax reduction despite universal government paid-for health, dental and vision care–all of which our country does not have. We really have got to get this right and not let McCain and McKeon talk about the free market and make the ridiculous argument that a tax cut or credit would be enough for medical care, assuming the people with pre-extising problems and who have been uninsured for so long, can find an insurer that will cover them. There are European countries that have great medical care for the entire country and we are in America – the greatest country on this world and why don’t….. What do you have to say about all this?? Its not the talk of being compassionate that defines us–its the action of the nation’s leaders. Its not the amount of aide we give to Darfur, Ethiopia and to the aids epidemic that makes us compassionate. Taking care of others and letting our own people suffer is hypocritical. Taking care of all citizen’s health care needs will be the only real evidence of America’s compassion. It’s amazing to me that we have people presently in office that have done nothing over the past sixteen years to work on the energy problems we are facing right now! There are lots of excuses! Mc Keon, the current Congressman in the 25th Congressional District, takes the Newt Gingrich script insisting that off-shore drilling is the magic solution to high gas prices(remember Gingrich was the former republican speaker of the house that divorced his wife to marry one his political groupies and served the divorce papers on his wife while she was in a hospital being treated for cancer) and blames the democrats for higher gas prices–when in reality the democrats are saying (1) off-shore drilling should not be the only part of an energy bill (like the republicans are insisting) , (2) if it was such a solution, why aren’t the millions of current oil leases being drilled given the record profits the oil companies have earned and (3) just approving additional offshore leases is nothing but a political smoke-and-mirror trick at election time to try and get people to forget he and his republican colleagues were in leadership for 10 years and did nothing (Buck was a ranking member on the House Armed Services Committee and chair of another for nearly a decade BEFORE the democrats took back the House just 19 months ago). Our gas prices are outrageous! Just because they go down a little before the election everyone is supposed to be happy! Wow it doesn’t take much to distract people from the utter failure of McKeon and his republican colleagues! The republican leadership talks to the oil executives after record profits for a year and a half and the prices drop just before the election! I smell a con job. The war in Iraq can’t be ended, McCain says we may have to be there 25 years and then there are peace agreements being discussed, again before the election, but not before the defense contractors make BILLIONS on inflated billings and waste. We need fuel and we are competing for it with the rest of the world. We sell what we pump in this country to other countries and we let our investment bankers drive up the prices by speculative bidding on oil futures because in 1999, McKeon voting for a banking bill that took regulations off the banking community. Our supplies will run lower and lower and the prices will get so high that people will not be able to get to work. Its already happening in some parts of the country–people quitting jobs because some of our fellow Americans can’t afford gasoline and groceries and rent. The stock market goes up not because, we the people, are doing better, but because stock portfolios go up (due to oil company, Wal-Mart and defense contractor profits) and reduced payroll (layoffs, terminations, etc). The machinery that needs fossil fuel today should have been improved or converted long ago. Running on different types of energy is a simple alternative. Energy sources other than fossil fuel, such as solar, electric, geo-thermal steam and wind are out there. We used wind to pump water over a hundred years ago. In Brazil, drying sheets are used to dry out coffee, grains and other products–we don’t need electric powered drying machines. The Stanley Steamer at the beginning of the 19th century traveled 90 miles an hour on steam! There is so-called “clean coal”, but it is STILL coal that requires the land to be stripped and water contaminated! There is nuclear energy and they say it’s no problem- it’s NUCLEAR and we can’t store the waste we have now from our limited use of it!! Alternative energy auto/engine types have been invented-we know that the auto industry has them available but something called windfall PROFITS got in the way – Oh My!! McKeon should have been working on solutions, working with auto manufactures, inventors and investors years ago -they should have demanded years ago that we change our energy, manufacturing focus and transportation planning policies across this country –instead McKeon and his buds stuck their head in the sand, asked for your vote and blame the democrats for not drilling offshore. McKeon has driven us into devestating debt-we are over spent… there isn’t a military appropriations bill that McKeon did not like–even when the bill put profitable contracts in the hands of Blackwater, Cheney’s Halliburton, Barbara Bush’s AFIES and so many others, when our boys could not get the armour they needed, the vehicles they needed or the troop support they needed when we were losing them. McKeon was too busy paying Haliburton mercenaries three times what our comparable GI’s were getting paid to be in harm’s way wearing the uniform of our nation. McKeon is not just a friendly country congressman, but a ranking member of the House Armed Services Committee and chair of another— and what was the result, deficit spending, more debt, no energy solutions , more jobs lost to overseas competitors with the blessing of congress’ tax policies (giving tax breaks to companies that move our jobs overseas) and horrific wounds and disabilities from unprotected humvies and needless deaths from helicopters falling out of the sky due to mechanical failures! What adds insult to injury, is that Buck McKeon, who claims to be patriotic American, is funding military build-up of Communist China. The war debt is being funded by loans/bonds that China is buying. Every wasted dollar pays for a part of a nuclear missile aimed at us and for the build of of an Army of the East (maybe the Biblical army from the East??) (e.g. Communist China, who makes many of Wal-Mart’s products)-most of of our debt was incurred recently for a War we are still in and now we are nearly broke. McKeon wants you to forget that record and is again asking for your vote by voting for a wilderness bill after years of supporting the coal industry’s stripping of the land, the mining companies in our area dumping waste into our water shed and tables (like CEMEX, American Borax, and many others)–do you know the water in Boron, CA is too toxic to drink? 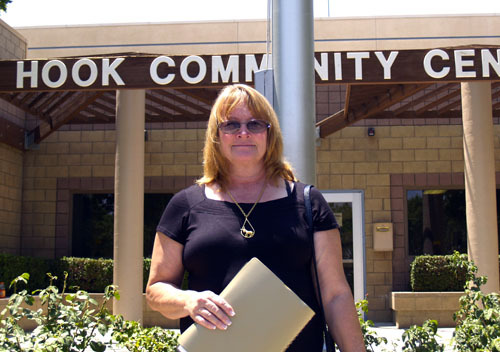 Do you know Palmdale-Lancaster’s water is full of arsenic, a toxin from military contractor’s (who Buck takes money from) dumping over the years? Do you know, the Owens Valley air in Inyo County is too toxic for people with respiratory problems? And what about the clean up in North Santa Clarita of defense contractor dumping? What good does it do to make areas in Inyo County Wilderness areas when the water is being ruined for the people who live there? What type of hyposcrisy is that? What type of hypocrisey is it to allow the City of Los Angeles to take Inyo and Mono County water for a city that irrigates golf courses for the rich while the streams and lakes that support fish and wildlife (and people) are polluted and or shrinking due to the water abuses? Making a wilderness area that will be so dry that the first lighting strike might burn it up, is hypocrisy. Stop making excuses for McKeon and his people – we can’t let it continue and I don’t think it is right to leave our kids and grandkids a country and District in such a mess. I love my family and care about other people and I think it’s wrong for all of us to continue being comfortable about any of it-I’m not happy with the lies and decptions and alot of folks out there are sick and tired of everything that’s going on! To those of you in leadership Congress now-Where are you and what are you doing?? You have nice big houses and well fed families and you give yourself raises every 2 years, no matter how bad the economy is doing or how bad of a job you have done–in the private sector, McKeon would have been fired a long time ago. You continue to waste alot by doing little-you are spoiled and have not changed our economy for the better! Hey-don’t complain about everything — instead be a part of the solution- just get into the action and Vote for a change – it’s not a word, it’s a begining of a solution!!! !